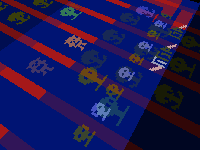 The pixels rendered by the Atari 2600 emulator can now be treated as matrix data by Jitter. So, the game screen can be moved about in 3D space, stretched, and mapped to various types of surfaces (a sphere, for example). Embedded within the Max/MSP programming environment, these manipulation parameters can be changed in relation to a signal, directly tied to music played through MSP. It also means that a nearly unlimited number of manipulations can be done at the emulation level. Memory accesses can be visualized (including both RAM and ROM), colors manipulated, and synchronization signals tweaked. Of course, it is only usable if you have Max/MSP and Jitter (which cost a lot of money); though perhaps someone will do something like this for Pd? 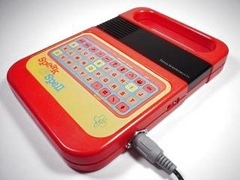 There are kits to add MIDI interfaces to a lot of old synths; and now, someone has developed a MIDI interface kit for the Speak & Spell. The kit (costing US$49.95; assembly required) puts a MIDI socket in the side of one of the early-1980s talking toys, connected to a microcontroller that performs various glitchy circuit-bending operations on command. It has several modes: two ways of accessing ROM sounds by playing notes or sequences of notes, and one which maps keys to the keypad (with leftover keys serving as "glitch control").